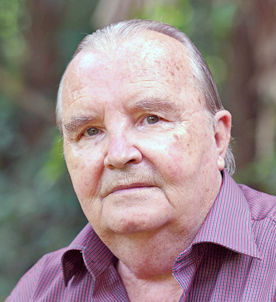 Georges first came to the Sri Aurobindo Ashram in 1970, after having been a well-known poet and having had a successful career as playwright and artistic adviser of the Dutch Theatre Company of Ghent, in Flemish-speaking Belgium. The ‘roots’ of his writing, he said, produced their first shoots at 14 when he ‘spontaneously’ started writing poetry. This led in the late 1950s and 60s to the publication of three volumes of poetry and a number of poems in various magazines. He also wrote nine original plays, translated and adapted a number of plays of other authors and wrote essays and articles. His literary talents were acknowledged when he was awarded the 1965 Prize for Literature by the City of Ghent. In that period Georges read a staggering amount of books in Dutch, German, French and English. 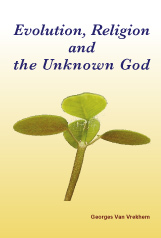 One of the authors was Satprem whose Sri Aurobindo or the Adventure of Consciousness ignited a spark. “This is what I had been looking for,” he said afterwards. But it took some time for the spark to become a flame. Georges’ reading, writing and theatre work were complemented by a regular immersion in the bustling nightlife of Ghent – he knew all the pubs, he said afterwards – to ‘interact and discuss issues with the artistic society of Ghent’. Then, in 1970, after a brief stint as tour guide, this life ended when he moved to a small room in the Rue Suffren in Pondicherry and joined the Sri Aurobindo Ashram. As he later wrote in a poem, “One day I broke through an inner wall and found a fire within, and the power of that fire has gradually conjured me to another continent.” The Mother gave him the name Matriprasad (meaning ‘Blessing of The Mother’ or ‘Offering to The Mother’) which he however never used. He started teaching at the Ashram school and, because of his proficient language skills, also became one of the secretaries of the Sri Aurobindo Society, in charge with international relations for their project Auroville. Yoka and I met him in 1976, during our first visit to the Sri Aurobindo Ashram. Georges had stopped working for the Society, had started practicing astrology and was translating Satprem’s triology The Mother into Dutch. Could we find a publisher, he asked? But the publisher deemed the investment too risky. This led to the creation of Stichting Aurofonds, a Dutch Foundation that aims at supporting Auroville and at publishing books from and on Sri Aurobindo and the Mother in Dutch and other languages. With the help of this foundation the trilogy was eventually published. Over the years, Stichting Aurofonds remained instrumental in helping to publish Georges’ books. In 1995, Georges began writing his own books. 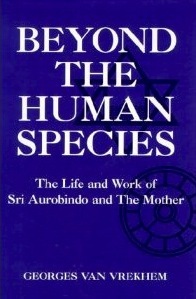 Voorbij de Mens, Leven en Werk van Sri Aurobindo en De Moeder was published in 1995; he then transliterated it into English as Beyond Man, the Life and Work of Sri Aurobindo and The Mother. It was published in India in 1997 and became a highly acclaimed seminal book. Amal Kiran (K.D. 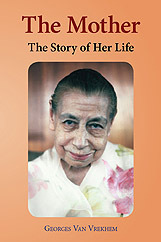 Sethna) judged it “among the best that have been written on Sri Aurobindo and the Mother.” In this book Georges, for the first time, spoke about Sri Aurobindo and the Mother as the Two-in-One, the double-poled Avatar of the Supermind. That same year the publication of Georges’ compilation of Mother’s conversations translated into Dutch appeared. 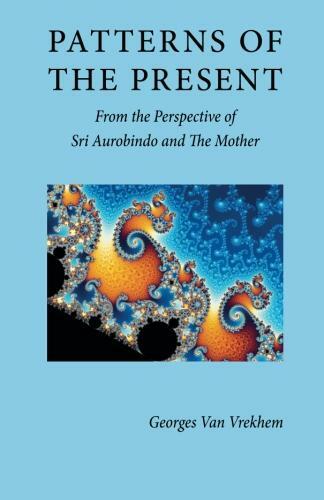 This compilation was later published by the Sri Aurobindo Ashram under the title The Vision of The Mother. Georges had meanwhile been able to build and move into a two-room house in the Shakti community nearby Aspiration. It was a true hermitage, filled with books, with just sufficient space for a desk and a bed. Continuing his habit of reading copiously (friends and friendly foundations would donate towards his book purchases), he wrote several more books: an extensive biography The Mother, The Story of Her Life (2000); Overman – the Intermediary Between the Human and the Supramental Being (2001); and Patterns of the Present – From the Perspective of Sri Aurobindo and The Mother (2002). Then, for a period of four years, Georges spent his time studying one of the most gruesome periods of human history, the Second World War. “This reading makes me sick,” he used to complain. His motive: “Sri Aurobindo and the Mother had been speaking to their disciples about this War, about its occult significance, and about the asuric entity that possessed Hitler. Is there any historic material that collaborates their views?” There was, plenty – in German, English, French, Dutch and Spanish. His bookshelves soon flowed over. 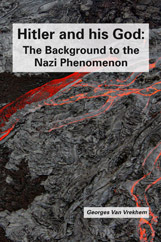 But it was with more than a sigh of relief that Georges finally disposed of this collection when his book Hitler and his God, the Background to the Nazi Phenomenon was published in 2006. He continued writing about aspects of Sri Aurobindo’s and the Mother’s vision, such as the book Evolution, Religion and the Unknown God (2011), where he described the various theories of evolution and the concepts of Sri Aurobindo and the Mother. 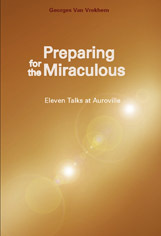 That same year saw the publication of his last book, Preparing for the Miraculous, containing the eleven lectures Georges had given in 2010-2011 at Auroville’s Savitri Bhavan and Town Hall. In the last essay in this book Georges shared his conviction that the Two-in-One Sri Aurobindo and the Mother were, in fact, the Kalki Avatar who, in the Hindu tradition, will come at the end of the present Kali Yuga. On the afternoon of 31 August 2012 he left his body following a cardiac arrest. He was 77. Georges had been fighting coronary arterial disease for over 20 years. It was my last lunch date with Georges, just a week before he passed away. We were at Goodman’s—a local restaurant that I had introduced him to. Georges favored the local village eateries over the more expensive, Westernized Aurovilian ones, and in the fifteen years or so of our friendship, in successive lunch dates, we had eaten our way at every joint past Pitchandikulam bridge down to the East Coast Road. Goodman quickly became with Georges—it was air-conditioned and equipped with a generator against the frequent and erratic power outages. And Georges with his heart ailment suffered from the heat, which was particularly harsh at mid-day. Besides Goodman did a good job of preparing his favorite meal—rice and chicken curry—which he washed down with coke. Of late, the topic of death had casually slipped into our conversations. Over the past year, Georges had been through severe health challenges, and we both knew that as someone with a serious ailment of the heart, death was always in the wings, waiting. “People don’t believe that I am ill,” he would jokingly complain. “I will have to die to prove them wrong!” I would laugh with him, and then send a secret prayer that he would live for many more years, for I knew he wanted to live and see to light the umpteen book projects gestating in his mind. That afternoon at Goodman, Georges was in a upbeat mood, and for the first time in the past year, our conversation focused around his ideas for future books and not his health. I no longer recollect how our relationship evolved over regular lunch dates to a deeply caring and endearing friendship. I remember that shortly after I had moved to Auroville, Georges ask me to read a draft of his then forthcoming book (and in my opinion, his best) Beyond Man. Georges was just venturing into writing in English (as opposed to Dutch), and given my background in English literature, he wanted to know if he had an acceptable command over the language. It also helped that I was a newcomer and not likely to argue against his theories, for though Georges was highly original in his interpretations of Sri Aurobindo, he was also sensitive to criticism. This was the first of Georges’ many contributions to our understanding of Integral Yoga: His writing stemmed from the depths of his readings. He must have been one of the very few people to have read all of Sri Aurobindo’s and the Mother’s works in original (not in translation) from the Arya to the Agenda and to the latter releases such as The Supramental Manifestation and The Record of Yoga. The second gift he had, one that I never of tired telling him, was that he had a rare, if not unique, insight into and understanding of Western and Indian culture. He was widely read in Western philosophy, and during the forty years of his life here, he had immersed himself into Indian culture and its literature—particularly the epics. I always felt that to truly understand Sri Aurobindo, who had so deeply assimilated into his being the best of the East and the West, one must be able at some level to integrate the two cultures. In that memorable last lunch date, I again reminded him of the above fact. With some sadness, which was uncharacteristic of him, he mentioned that he did not know why he had to waste so many years leading a bohemian life in the theater world of Belgium, which was so alien from his current reality and the deeper meaning that Sri Aurobindo and the Mother had opened him to. I looked him in the eye and said, “Georges, those must have been the years when you were reading and acquainting yourself with the best of the Western writers.” He brightened up at that memory and proceeded to relate stories from his life in Belgium. He had a sharp memory, and he peppered his recollections with certain experiences and dreams that had led him in 1970 to leave his career as the manager of a theater in Belgium and come to the Ashram, and then later, in 1978, in the birth-centenary of the Mother, to come to Auroville. “In the Ashram,” said he, “people were celebrating the Mother’s birth anniversary, but I felt a distinct command to leave the Ashram and join Auroville. I loaded my books onto a bullock cart and not fully cognizant of why I was doing this, I cycled behind it and came to Aspiration.” Till the very end, Georges was a voracious reader, and his house in Auroville literally overflows with books. Having been a playwright, Georges had a knack for dramatic flair that comes strongly through, both in his books and in his talks. He was a born storyteller—another gift, which make his books accessible to a far-ranging audience. It was Georges’ meticulous and chronological research into the writings of the Sri Aurobindo and the Mother as well as his knowledge of French that made him such an original interpreter of their works. 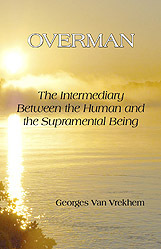 In this regard, one of his contributions as an Aurobindonian scholar was to point out that the term, surhomme, which the Mother used, was better translated as “Overman” and not as “Superman.” To Georges, this was a crucial difference, for it pointed out to the inevitable necessity of there being transitional species in our evolution to the Supermind and also it made our goal a bit more accessible. “We are,” Georges would say, “all of us who seek to go beyond our human nature are ‘apprentice overmen’.” Among his other original contributions to our understanding of the yoga, which overthrew previous interpretations by the primary disciples, was that he asserted with full conviction that “the Mother’s work was not postponed” but accomplished as she had willed it; and that it was not Sri Aurobindo who represented the Kalki avatar, as for instance Amal Kiran had mentioned, but both Sri Aurobindo and the Mother together, for their consciousness was one. To be honest, increasingly confronted with the frailties of my own human nature, I did not care much for such metaphysical distinctions. It seemed hard enough to keep the flame of aspiration burning steadily in one’s heart and to practice the rejection and the surrender that are such an integral part of this path. In our conversations, I would steer the subject to more mundane matters. No topic was taboo. We discussed sexuality and the value of relationships in Integral Yoga. We discussed the need for war: I railed to him when Bush went to war with Iraq in the flimsiest of excuses. Georges patiently heard me out and explained that wars were seldom about the purported causes, but about a swifter and deeper integration of human kind. To him, American imperialism and consumerism as well as Islamic fundamentalism both had to be destroyed in the movement toward a new world. We discussed esoteric ideas, such as the meaning of the Auroville symbol or as to why the Mother was always seated to the right of Sri Aurobindo. I once expressed my inability to read the Agenda, for (as opposed to my love for the Entretiens) I could not relate to the Mother as she came across in Satprem’s transcripts. Georges, who had been a translator of Satprem, explained that the Mother was always reflecting the consciousness of the person in front of her, and one of the book projects that he wanted to work on was to provide a proper introduction to the Agenda. We talked about the changing mores in India, and again he wanted to write a booklet addressed to Indian youth. We chatted about fellow Aurovilians—while Georges occasionally complained that Aurovilians knew little about Sri Aurobindo and the Mother, he held this experiment of Auroville in high esteem and commended Aurovilians for making that great leap toward the building of a new world. He knew that progress in the yoga depended on one’s sincerity and openness and not on an intellectual understanding. It was to assert the importance of the Auroville experiment in the practice of the yoga that he subtitled one of his last books, “Eleven Talks in Auroville,” for he rightly regarded those talks to be a gift from Auroville to the world. As a person, Georges’ greatest gift was that he was a truly good human being. Unassuming by nature, compassionate and patient with the struggles of others, quick to laugh at his own foibles, with a ready sense of humor and an undisguised love for good food and the occasional glass of beer. Somewhere, I remember, the Mother talks about two major movements in yoga: one renounces everything to focus only on the Divine; the other embraces everything in its search for the Divine—there is an unquestioned trust that the Mother is there behind everything, and that what really counts is Her Action in this world. Georges and I both leaned toward the latter movement: that was the secret of our friendship— we loved life with a passion, viewing it, despite all contradictions, as a progressive manifestation of the Divine spirit. The help that I got from Georges was perspective: He had a remarkable gift of interpreting and contextualizing both personal problems in life as well as current events in the world in the larger context of Integral Yoga. If one looks back on one’s life, one realizes that there have been only a handful of people who have truly helped in one’s own evolutionary journey toward personal growth and development. Georges was definitely one of those beacons in my life. Georges is gone. He will be deeply missed in Auroville. As a few Aurovilians mentioned to me, in the days after his passing, that Georges was a fount of aspiration, who imbued our collective effort with depth and meaning. His books will of course continue to live on. Indeed they have been given a new lease on life and are soon due to be released as e-books. In a quirk of fate, it was the last project that he worked on: At the initiative of the Dutch foundation Stichting Aurofonds, Georges had to re-read all his books—proofread and correct scanned versions—so that they could be published online as e-books. It essentially meant that Georges himself reviewed the work that he had done in his last decades as a scholar of Integral Yoga. He mentioned that afternoon at Goodman’s that he was satisfied with his accomplishments and reminded me, how in his last darshan, the Mother had tapped him twice—Georges felt that by doing so the Mother had blessed both his life and the books he felt so compelled to write.